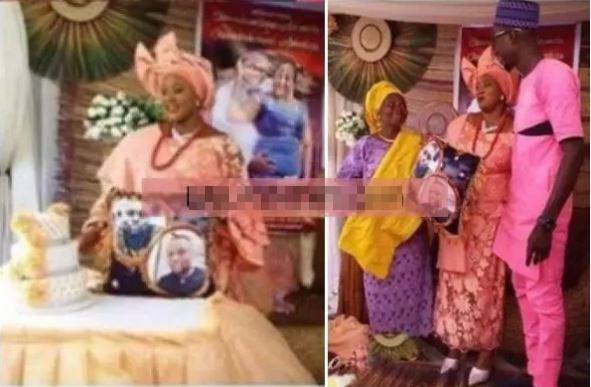 A woman married her absent Dubai husband with pillow yesterday in Abeokuta, Ogun state. We have all the photos below. Scroll down to see them. 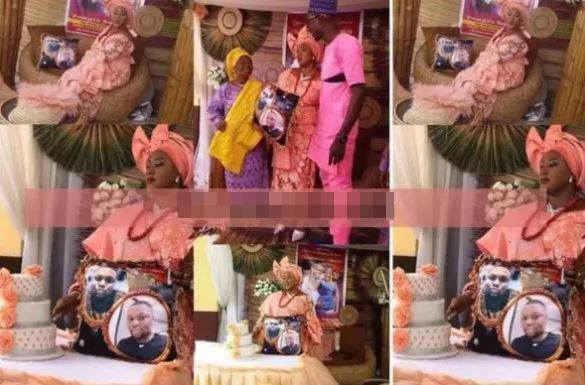 According to social media reports, the woman’s Dubai-based fiance was for reasons currently unknown, unable to attend his own wedding, so a throw pillow was used to represent him. In the wedding pictures, his bride is seen gorgeously and tastefully dressed as she beams with joy. This won’t be the first time a Nigerian woman is getting married to an absent abroad-based husband who was represented with pillows. But as usual, this lady’s current wedding has drawn a lot of reactions online, with many Nigerians criticizing the move, while others expressed shock. Desperation. Is this the wedding pic you ‘ll show to your kids?